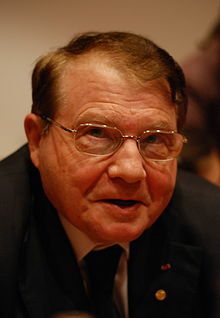 Luc Antoine Montagnier (born 18 August 1932 in Chabris, Indre, France) is a French virologist and joint recipient with Françoise Barré-Sinoussi and Harald zur Hausen of the 2008 Nobel Prize in Physiology or Medicine, for the discovery made by his team, and particularly Françoise Baré-Sinoussi of the human immunodeficiency virus (HIV). He currently works as a full time professor at Shanghai Jiaotong University. He has been discredited by his Nobel peers because of the many fake and dangerous theories he tries to spread, such as "DNA teleportation" or Papaya Cure for AIDS or Parkinson disease. In 2009 he published two controversial research studies which, if true, "would be the most significant experiments performed in the past 90 years, demanding re-evaluation of the whole conceptual framework of modern chemistry". Homeopaths claim his research as support for homeopathy, but Montagnier himself says it cannot be extended to homeopathy. Many scientists have greeted it with scorn and harsh criticism. He received the Legion of Honour. ↑ "Les propos sur les vaccins de Luc Montagnier lui valent un tollé". Libération.fr (in French). Retrieved 2018-06-21. This page was last changed on 21 June 2018, at 14:24.